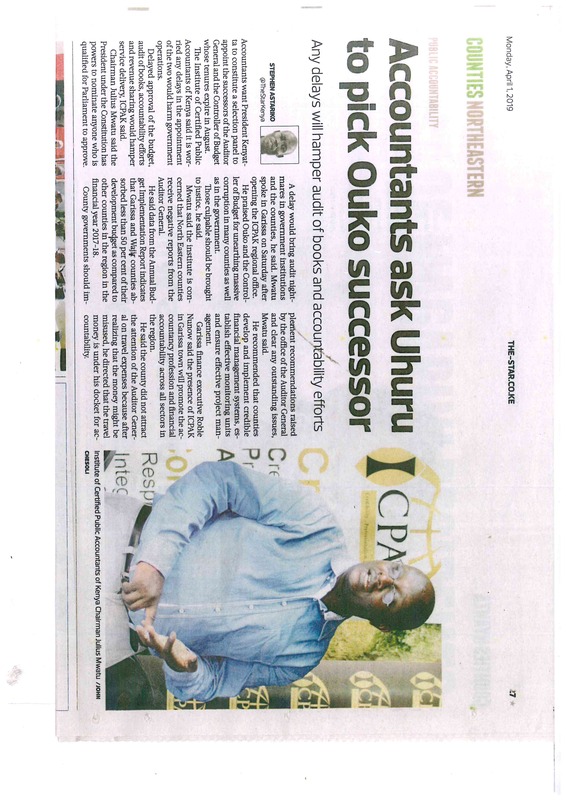 The Institute of Certified Public Accountants of Kenya (Icpak) wants President Uhuru Kenyatta to constitute a selection panel to start the recruitment of successors to Auditor-General Edward Ouko and Controller of Budget Agnes Odhiambo who are set to leave office in August. The accountants’ body is worried that a delay in the appointment of the new Auditor General and the Controller of Budget will impact negatively on timely approval of budget and audit of various books across the country. “The institute therefore implores the President to urgently constitute selection panels in line with Section 11(5) of the Public Audit Act, 2015 and Section 4 (6) of the Controller of Budget Act, 2016 for the purpose of considering the applicants and selecting at least three qualified persons, separately, for appointment to the offices of Auditor-General and Controller of Budget,” Icpak chairman Julius Mwatu told the Business Daily last Friday. “A process started well in advance, will ensure that we do not run into the challenges that have characterised transition in the various commissions,’ he said. 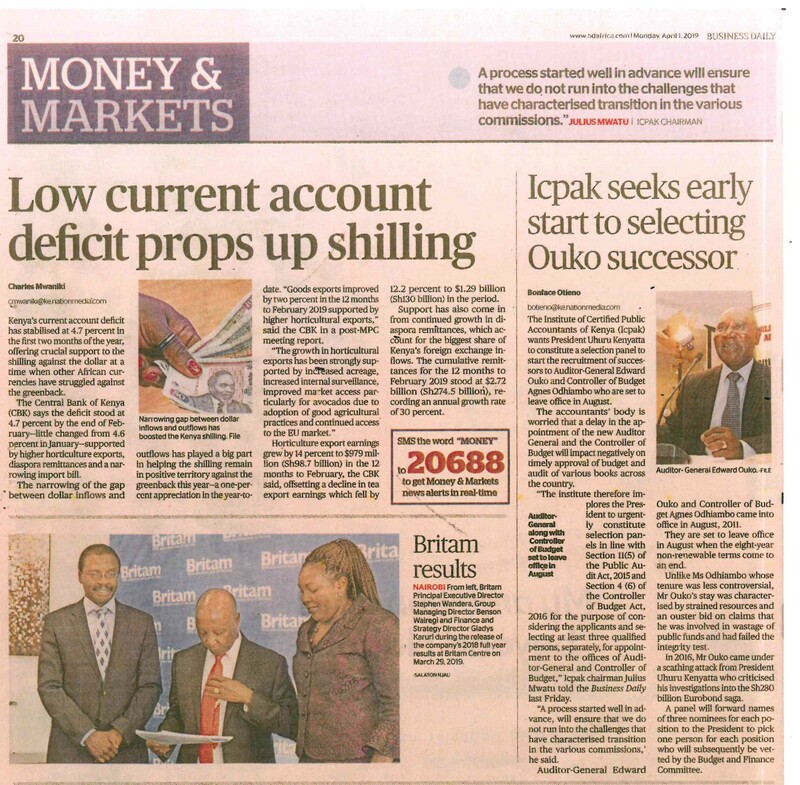 Auditor-General Edward Ouko and Controller of Budget Agnes Odhiambo came into office in August, 2011. They are set to leave office in August when the eight-year non-renewable terms come to an end. Unlike Ms Odhiambo whose tenure was less controversial, Mr Ouko’s stay was characterised by strained resources and an ouster bid on claims that he was involved in wastage of public funds and had failed the integrity test. In 2016, Mr Ouko came under a scathing attack from President Uhuru Kenyatta who criticised his investigations into the Sh280 billion Eurobond saga. A panel will forward names of three nominees for each position to the President to pick one person for each position who will subsequently be vetted by the Budget and Finance Committee.